Michael and Vicki Lensing became the owners of one of Iowa City's longest running businesses in 1978. Formerly the Donohue Mortuary and before that the Hohenschuh Mortuary, Lensing Funeral & Cremation Service is one of Iowa City's oldest funeral homes. Frank Hohenschuh, a local furniture builder who applied his carpentry skills to casket construction, founded the business in the 1890s. He was succeeded by his son, William, who may well have been the father of the funeral profession in Iowa. William Hohenschuh (pictured above) organized the Iowa Funeral Directors Association in 1891, served as President of the National Funeral Directors Association in 1894, founded two colleges of embalming, and traveled widely as an author and lecturer. 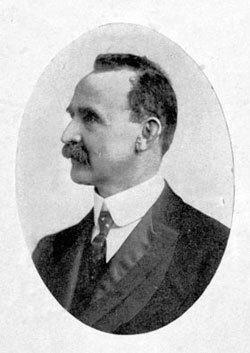 William died in 1920, and the company was purchased by John H. Donohue, who was succeeded by his son, Walter J. Donohue. In November 1978, Michael and Vicki Lensing purchased the Donohue Mortuary and continued to serve families in the landmark Linn Street facility until 1984 when they moved to Kirkwood Avenue. Lensing Funeral & Cremation Service has been an honored recipient of the Pursuit of Excellence Eagle Award, the highest award in funeral service presented by the National Funeral Directors Association, the largest funeral service organization in the world. Most importantly to Michael, Vicki, and their staff, Lensing's is a proud and active member of the greater Iowa City area community.